View Poll Results: Who are your favourite mutants in the comics? Well, as per usual I chose Raph. Not just because he's my favorite character period, but because IDW has done a good job with him, I think. He isn't just a pure rage monster and toughguy, he has a little more depth, although I really do wish for once someone would try and get to the root of his anger outside of the "I'm a freak" angle. Anger is a form of depression, how hard is it to run with that for character development? I am gonna do like everyone else and say that outside the turtles, if I had a second pick, it would be Old Hob. He's just turned into such an awesome character. Starting out just set on payback for his eye and turning into what he is now, wow. Such great development. All these characters are great and at the end of the day, the winner is us since all of them are so great. I think there's room enough for villains with conviction and villains that can be swayed; I'm not an all or nothing kind of guy. But if a writer is going to aim for the latter, then they have to take EVERYTHING into account, even the behavior that will most get in the way of that character's redemption. Leo spent more time atoning for his actions as Dark Leo (where he didn't kill anybody) than Alopex has spent atoning for her time with the Foot (where she killed numerous people for kicks). And there's just something really wrong with that. I don't think we readers can claim just yet that the writers have totally put Alopex's past with the Foot under the rugs. There is still room for development and her actions might catch up with her. As for atoning, Alopex is not a central protagonist like Leo, so she may be doing all these things behind the scenes. She was all alone in the woods in Northampton, probably in turmoil. Perhaps in the next volumes we may get flashbacks of those moments. I am gonna do like everyone else and say that outside the turtles, if I had a second pick, it would be Old Hob. He's just turned into such an awesome character. Last edited by Icegaze; 01-07-2015 at 12:28 PM. 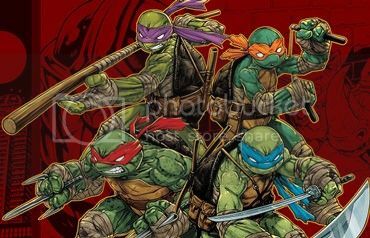 Even though Raph and Mikey were my favorites as a kid, I've grown to love the four brothers equally and honestly can't choose between them. So the four Turtles as one, and then Old Hob and Slash. Old Hob is amazing, and I really hope he continues to walk a fine line between ally and adversary! I'm also really hopeful that he and Raph will grow to accept each other as grudging allies, as Hob was so hellbent on killing Raph in the very first issues... I think it's about time Raph got a little character development and put aside his personal grudge with the cat. -. Rocksteady - I wasn't fond of the idea of bringing them back in the IDW series because of how goofy they were in the Fred Wolf cartoon, but man, have the writers and artists of this version done a fantastic job at making me do a 180! Well, I voted for Koya, but more as a reaction to how neutered Alopex's character was. It seems that whenever a female character is introduced who is a "villain", they inevitably become sympathetic in order to transition them into a love interest for a male "hero". So instead of being "evil", the female character was just "confused" or "didn't know any better" and it took the hero's masculine charms to make them see the error of their ways. It's asinine and patronizing. Alopex started out as a villain intelligent enough to manipulate the emotions of others (Raph), high enough in the Foot command to kick around Bebop and Rocksteady (when they were human) and become a contender for second in charge, and was vicious and cruel enough to enjoy murdering people and even made games of it. She was drawn to be monstrous like something out of "The Howling" and seemed to be a villain with convictions. But suddenly, nope, "tragic backstory". She was just confused and now she's made a complete 180 and had a change of heart. And in the process, now she's drawn to be cute and adorable. Koya seems to be the mutant filling the shoes Alopex left behind. I like her atypical female design, being huge and muscular and intimidating instead of an anorexic hourglass. By all visual evidence she seems to be firm in her convictions as a badguy and hopefully she'll stay that way (unless the writers decide to make her a hero's love interest, then she'll have just been "confused" all this time). I dunno, of all the new characters she seems to have potential and maybe won't suffer the same indignities as Alopex. We'll see. I was conflicted a bit for my vote, since I really like how Hob turned around. He was a lousy character when introduced but has grown over the past few years in a truly organic way, learning his racket and becoming a genuinely interesting character. Hob isn't a genius or a superior fighter, but he knows how to coordinate the talent needed to get the results he wants. He's a natural leader and he's actually been PROVING it. The book isn't telling us how underestimated he is anymore, but showing it to us through his actions and I'm really digging it. Donatello would have been up there, too, if only for the new angle Waltz and Burnow have given him. They toyed around with his rebellious attitude when the book began, sort of let it drift away when the plot got too complicated, but now they've brought it back with a vengeance. It's nice to see something NEW done with a character that feels wholly organic for them and that's definitely exciting. Bebop and Rocksteady get an honorable mention if only because they're hilarious and great. They're that ideal difference between "comic relief" and "USELESS comic relief". They're stupid and funny, but they're powerful and serve their function. They aren't the useless bumblers who constantly ruin their boss's plans (like the Fred Wolf versions). And not only has Koya remained evil, we’ve also gotten Zodi, Krisa, and Ocho as more wicked she-creatures. Alopex seems to be an exception (along with Jennika). I voted Alopex because she’s cute and adorable like you mentioned, not to mention her meme potential. If you can’t handle her at her worst, you don’t deserve her at her best. Hob’s an interesting guy too. It's a tie between Herman, Slash, and Mondo Gecko. 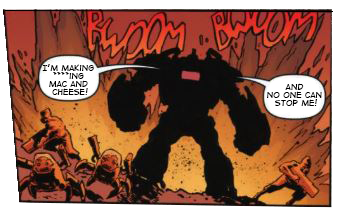 In IDW I like Hob, Koya and Herman the most. The first two for the most character development and character, and Herman is just funny and feels like he's from a cartoon. Their Bebop/Rocksteady especially in the mini's are pretty funny, funnier than in the main series. Sorry, but PK was actually a crossover character. They’d probably have to ask Dave Garcia to use him again. I think it's time to add Ravenwood to the list, because she's my favorite! Thanks for the info. I wasn't sure as to whom Panda Khan actually belonged to. Thanks for reviving this thread! I have been out synch with TMNT for over a year.